Effective responses to modern IT risks requires a transition from cyber security to cyber defense. This presentation introduces analysis based on proven military tools to understand, assess, and defend against cyber-attack. See how Petya worked its way in, and how to defend against it. Take away valuable tools and frameworks to develop your defenses. Griff is trained as a Canadian Infantry Officer and is a graduate of the Johnson-Shoyama Graduate School of Public Policy. After a two-year stint as a Strategic Policy Analyst at the Treasury Board Secretariat in Ottawa, he moved to London where he completed a Master’s Degree at the LSE. Unable to find “real” work, he got into software development as a Scrum Master, leading the development of a web based application. This experience fostered an interest in cybersecurity, and Griff went on to a boutique start-up providing application security to Fortune 500 companies. Frustrated by the disconnect between technologies and poor analysis within cyber security, Griff founded cyber defense firm Damrod Analysis in 2017. He is London based, where he and his wife are expecting their first child shortly. 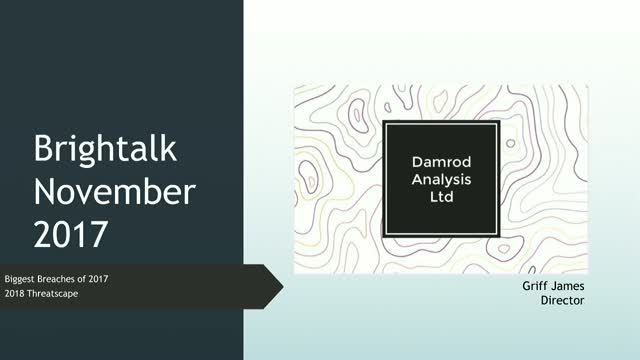 Presented by: Griff James, Director, Damrod Analysis Ltd.